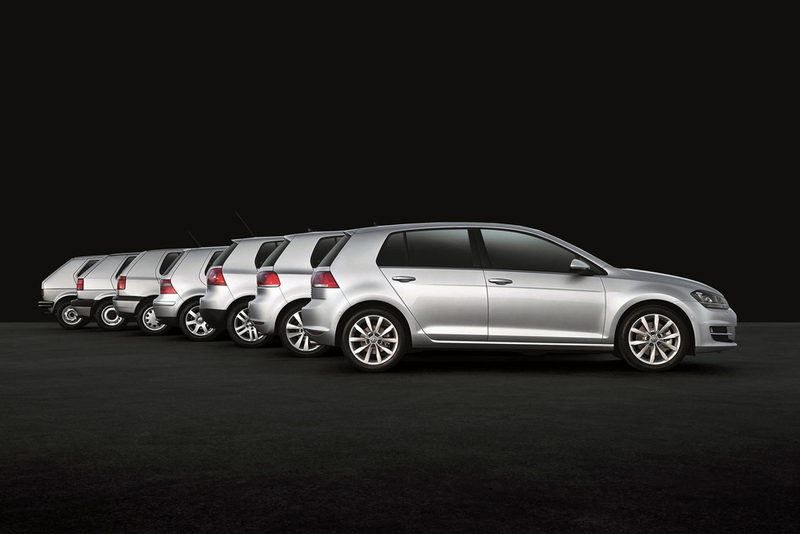 As a venerated nameplate in the Volkswagen range, the Golf has been around for seven generations and 43 years. Throughout its history, it’s become the brand’s best-selling vehicle (outselling even the Beetle) and has won numerous awards and accolades worldwide. The current generation is no different. It has won more than two dozen awards around the world including the World Car of the Year and the Japan Car of the Year (the first foreign nameplate to do so). After laying down the foundation by introducing the high-performance Golf GTI last year, Volkswagen Philippines has followed through on its promise to bring more variants of the Mk. 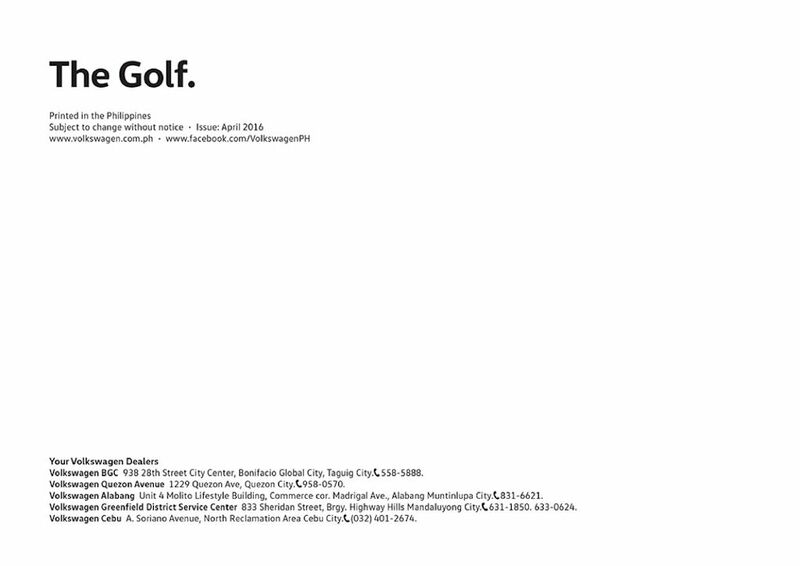 7 Golf with the introduction of the Comfortline and Highline. Volkswagen calls the Mk. 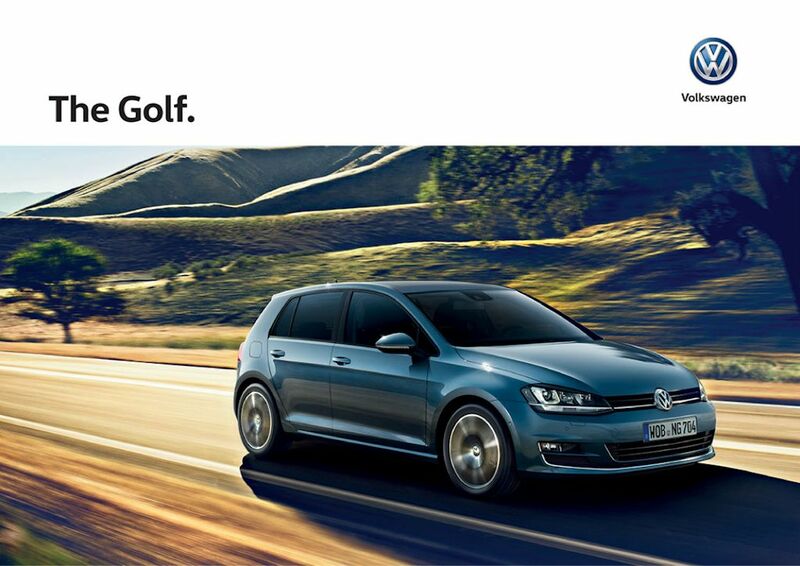 7 Golf a “democratization of progress” by bringing advanced design and cutting-edge technology to a mainstream hatchback. This starts with the MQB or Modular Transverse Matrix architecture—a new lightweight platform that’s up to 100 kilograms lighter than the outgoing model (the Mk.7 is actually as light as the 1997 Mk. 4 model). That’s followed by a 1.4-liter turbocharged 4-cylinder engine that’s high on power but low in fuel consumption and emissions. 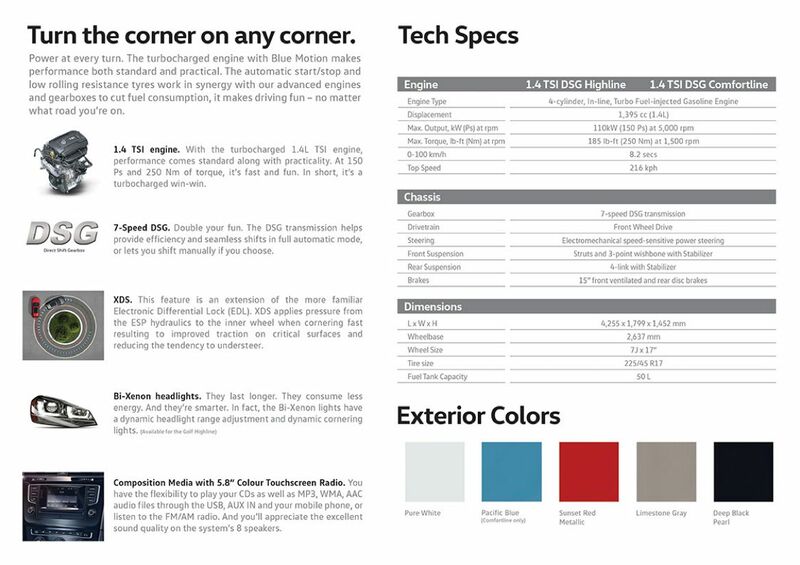 This TSI engine is rated at 150 horsepower and 250 Nm of torque. Mated to a 7-speed dual clutch automatic, it’s all enough to rocket this unassuming family hatchback from 0-100 km/h in just 8.2 seconds and to a top speed of 216 km/h. Finally, keeping all that power in check, the Golf comes standard with 225/45R17 wheels and tires. It also has corner-aiding technology such as XDS or VW’s front electronic differential locking system among a complete host of safety equipment. 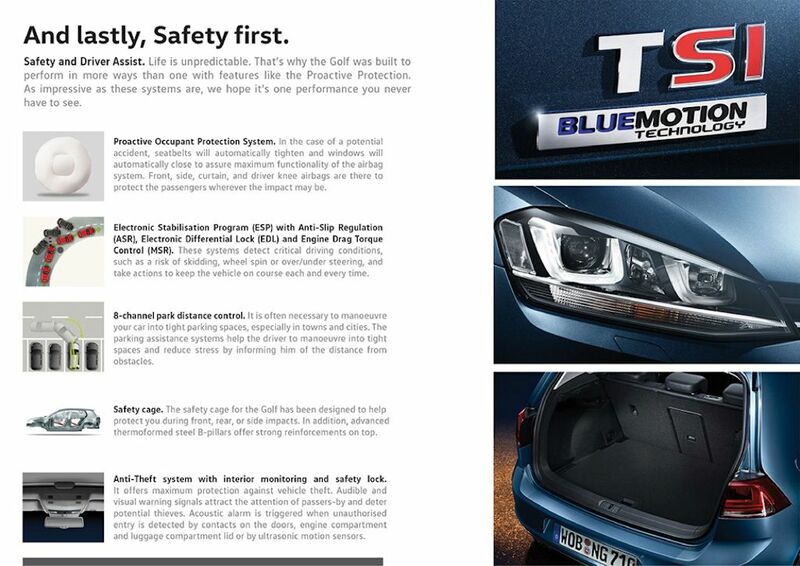 Badged “Blue Motion”, both Golf variants receive a regenerative braking system with idle start/stop technology as standard. With a slight increase in both length and width over the previous-generation model, the Mk. 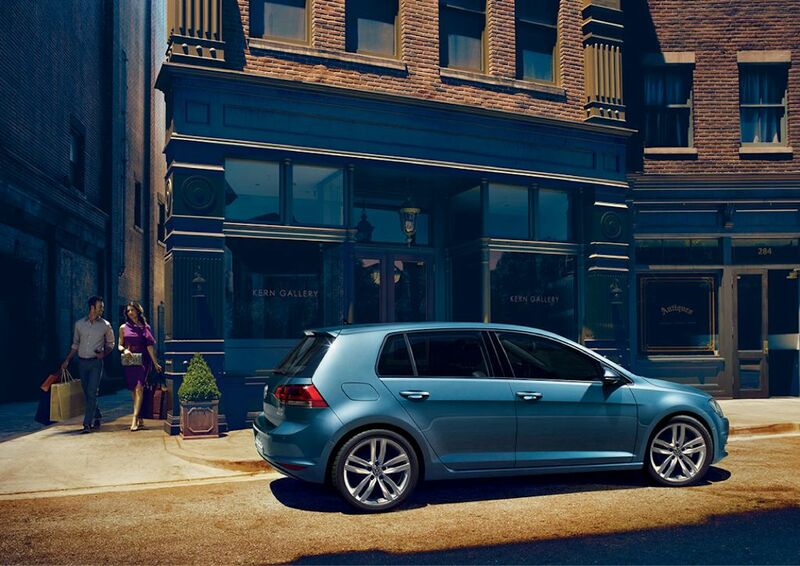 7 Golf features a more spacious interior with improved knee and shoulder room. 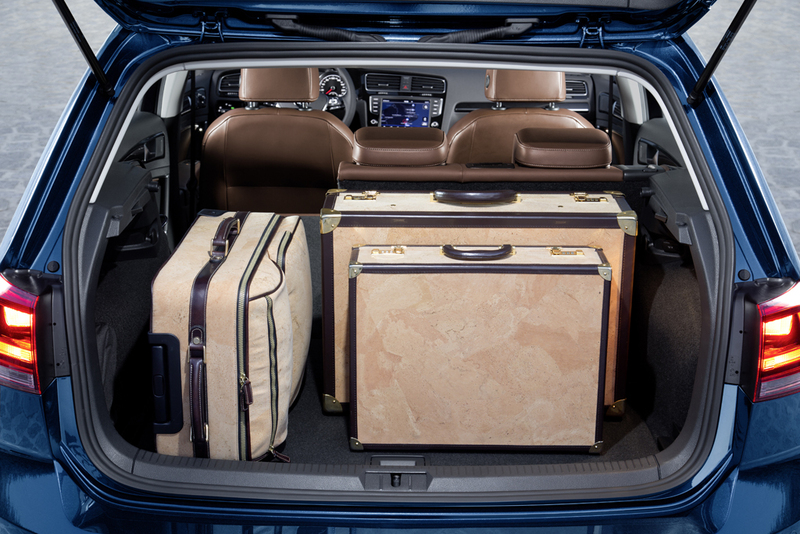 The cargo space is also generous: 380 liters with the rear seats up. 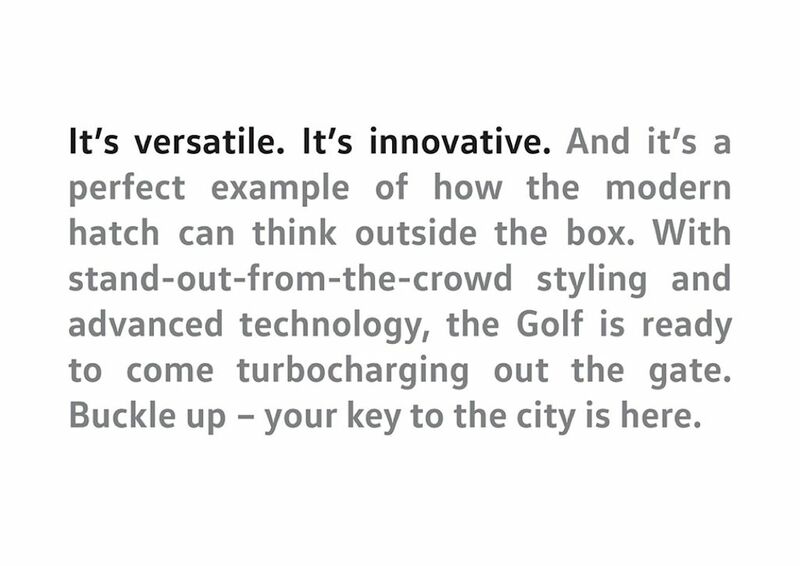 Eschewing gimmicky controls (a Golf trademark since the Mk. 1), the all-new Mk. 7 goes for clarity and precision to its ergonomics. 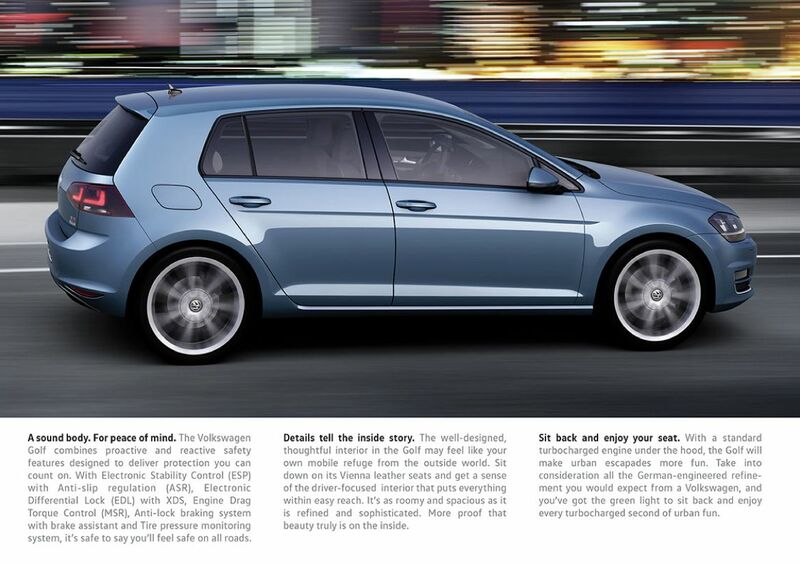 The contemporary yet sporty design of the cabin features an extensive range of seating and steering wheel adjustment. Engineers even paid close attention to the pedals, increasing the gap by 16 millimeters while the gear lever is raised 20 millimeters all in the name of ergonomics. In terms of features, front and rear parking sensors, and an electric parking brake are standard while the Highline gets leather seats, dual zone climate control with rear vents, a fancier 5.8-inch infotainment system with touchscreen controls and 8 speakers, and bi-xenon HID headlights with washers and daytime running lights in addition. 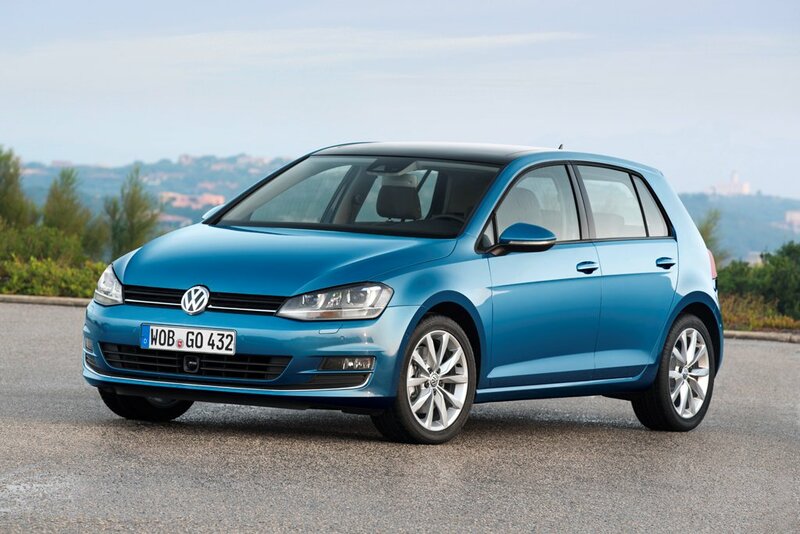 The new Golf variants are now available at all Volkswagen dealerships nationwide in five colors: Pure White, Pacific Blue (Comfortline only), Sunset Red Metallic, Limestone Gray, and Deep Black Pearl. The Golf 1.4 TSI Comfortline retails for P 1,590,000 while the Golf 1.4 TSI Highline goes for P 1,739,000. The design is plain and the price will put most buyers off, but I think it is a good car. I would buy it if it was priced around the 1.2m mark. if i had cash then that would definitely be on my shortlist. its an excellent look car. EXQUISITELY MINIMALIST. Vw phils will go out of business within 5 yrs. why? because you can't afford it? European car. That's all you're buying in this car. Status. But remember for Europeans this is nothing to be so proud about. Like it's name says VolksWagen means people's car. It's a very ordinary, cheap (for them) car. If one is so keen to stand out among the crowd go for it. If it's quality don't be fooled. Jap and even Korean cars are now at par or ever surpass European quality. So like I said you're just buying a European car. That's it. A ford focus sport 1.5 ecoboost makes more sense, it's bigger, longer and wider and is 310k cheaper! 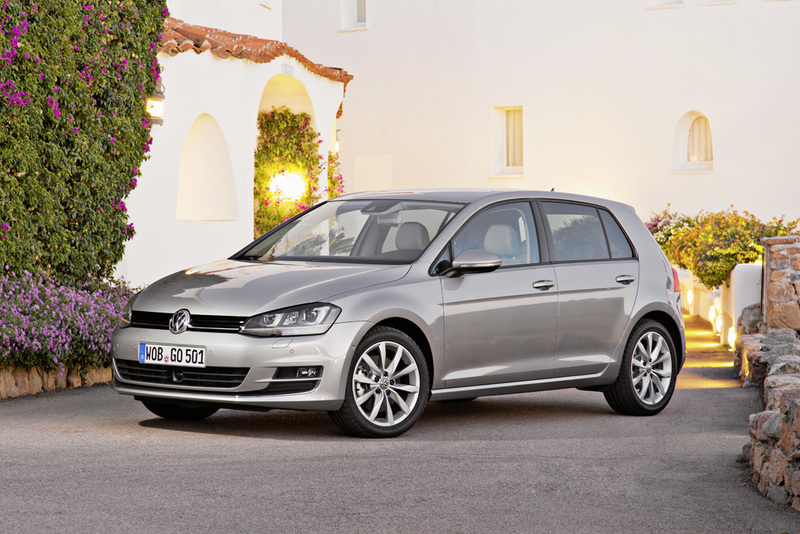 Only brand loyals and enthusiasts will go for the VW golf - which is only a handful. Not many by any stretch. Plus the other brands it has to compete with in terms of prcing- audi, volvo, bmw, etc which will make the sales suffer even more. C'mon VW, lower down the price a bit more to make make it palatable! VW cars are being avoided by consumers in the US, when I say avoided, I mean NO ONE IS BUYING THEM ANYMORE. Funny how these units end up here, in this part of the world. "If it doesn't pass the US standards, dump them in the 3rd world regions"
You do know that these are the gasoline engine equipped trims, right? VW cheat scam has brought a big gash of wound upon them. People in the know almost lost faith in the brand. Both petrol and diesel variants. Even up to now, their direct injected, DSG trannies are plagued with issues unsolved. Al Dy Jap and Korean cars surpass European cars??? Hahahahahaha better delete that comment or stop smoking weed. Filipinos trying to be experts in cars hahahahahaha you're funny homeboys. What you know about cars anyway you talking so much nonsense. Go back and fix your jeepneys or come out with an own brand. Typical pinoys don't know anything but acting as Professor. Stop cooking with wood before you talk about engines. google is your friend. It will make more sense that you do your homework first. VW and audi DI engines are plagued with carbons buid ups in the intake valves. Their DSGs are unreliable. Heck, pinoy jeepneys are more reliable!